The DRF14C Marumi Ring Flash consists of a main control unit which fits directly onto the camera hot shoe and a separate ring light unit which connects to the lens filter thread using adapter rings. This is ideal for macro/close-up photography due to the flash light source being positioned directly between camera lens and subject allowing for even/shadowless illumination of the subject. The flash has a 14m guide number and auto TTL exposure with Canon and Nikon SLR Cameras. The standard lens mount is designed for 52mm - Step-Up. Rings are also supplied in 52-55mm, 52-58mm and 52-67mm fittings. 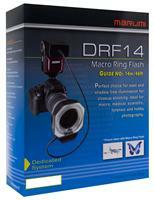 The DRF14N Marumi Ring Flash consists of a main control unit which fits directly onto the camera hot shoe and a separate ring light unit which connects to the lens filter thread using adapter rings. This is ideal for macro/close-up photography due to the flash light source being positioned directly between camera lens and subject allowing for even/shadowless illumination of the subject. The flash has a 14m guide number and auto TTL exposure with Canon and Nikon SLR Cameras.